PS Medway Queen – “The Heroine of Dunkirk”. From a very young age I was told that my maternal Grandfather was once the Skipper of the Medway Queen. Certainly I knew him as a Skipper and there was one occasion in 1970’s when I visited his ship, a coastal “oiler” based at Rochester. Two of my uncles sailed with these ships, one was also a Skipper and the other an Engineer. This and the fact that my father spent 22 years at sea would be a reasonable explanation for my fascination with ships, boats, sailing and the sea. The Medway Queen though, that was something special. 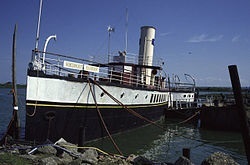 A passenger paddle steamer. She sailed mostly between Rochester and Southend for pleasure purposes. In 1940 however she joined the flotilla which came to be called the “Little Ships”. She was most famous because she was the only ship to make the trip 7 times saving more than 7000 of the British Expeditionary Force during Operation Dynamo even shooting down an enemy aircraft. She was commissioned and became HMS Medway Queen and took up mine sweeping duties. After the war she returned to civilian service until she was sold to a Belgian ship breaker. However, once the breaking company heard that this was “The Heroine of Dunkirk” they refused to break her. My first sight of her was tragic because she had been returned to the Medway and lay in the mud rotting half submerged just off Chatham Dockyard. Heart breaking to see knowing just a little about her heritage and my Grandfather’s involvement. This month therefore is very exciting because after many years of dedication her owners are very close to returning her to the Medway to her berth at Gillingham Pier. The Medway Queen Preservation Society have had her away for partial restoration in Bristol. My intention was for The Lune Pilot and I to be on the river when she is towed in but the logistics of this and the commotion likely on the river on this day suggests that this might not be a good idea for a small sailing boat. We shall see nearer the time. The remaining work on the restoration will take place at Gillingham. Last week I called in at the Gillingham head quarters of the society and chatted with one dedicated chap about the return journey and it was exciting to hear that they are soon to send the remaining windows and portholes to Bristol (she will need these to be fitted to be ready for sea) for the journey home. So this brings me to the question of whether or not Granddad was a Skipper on the Medway Queen? I now know that his service on the “Queen” was before the war. During the war he served on other ships and he did not return to the “Queen” after the war. I also know he did not obtain his Skipper’s Licence until some time after the war. Therefore, I can reveal that he was never a Skipper of the Medway Queen, sadly. He was a deckhand though and I am no less proud of that. Does this diminish my interest and excitement about the return of the Medway Queen? Fascinating reading. Would love to be there too as I also have family connections to the Medway Queen. TLP will post any information when she receives it and maybe we’ll both get there.